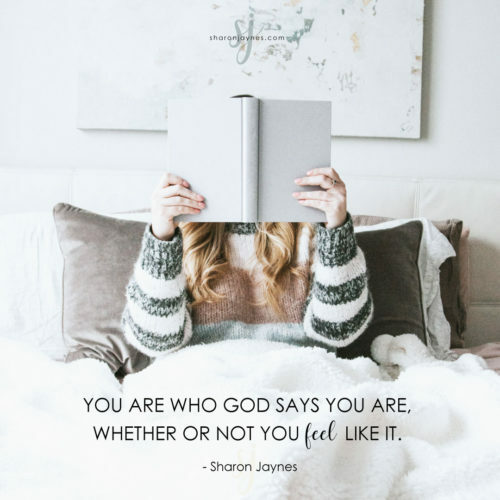 Do You Believe You are Who God Says You Are? We all have defining moments in our lives. The most important one is when we accept Jesus as Savior and Lord. I became a Christian when I was a teenager, but it would be many, many years before I stopped living like a spiritual pauper and started living like a child of the King. I wonder if you can relate? My problem was, I had no idea who I was, what I had, and where I was as a child of God. I had no idea the dramatic change that occurred in me the moment I accepted Him. So even though I knew I was going to heaven when I died, I wasn’t sure how to experience the abundant life while I lived. What changed? God stopped me one day and asked me when I was going to start believing the truth about my new identity. I knew Bible verses about a Christian’s identity as a child of God, but I didn’t necessarily believe they were true for me. Click & Tweet! I would have never said that out loud. But God knew. The lack of victory in my life reflected my unbelief. It is not enough to know God’s Word in your head. You must believe it in your heart. So let me go back to my original question. Who are you? If you know Jesus as Savior and Lord, then the following list is your true identity. Regardless of what others have said about you, regardless of what you think about yourself, the following verses are who God says you are…and that’s the truth. I have written these verses in first person “I” rather than third person “you.” I want you to read them, repeat them, and let them wash over all your feelings of inferiority, insecurity, and inadequacy until they disappear down the drain of self-doubt for good. And that, my friend, is who you really are! Let’s rejoice in this together. Leave a message and tell me which one of these truths mean the most to you! Ever feel that you’re just not enough? Now is the time to get rid of that lie once and for all with my latest book, Enough, Silencing the Lies that Steal your Confidence! Learn how to recognize the lies, reject the lies, and replace the lies with truth. Don’t let the enemy hold you back for one more minute! Also, check out the laminated Identity in Christ card to remind yourself every day who you really are! I love them all! I never thought about the fact that I am so much because of Christ and in Him who changed me, changed my life, and changed the way I think and what I try to do and to accomplish! What an honor it is to be called a child of the Almighty King, to bask in the glory that is God, to be accepted by Him, faults and all, to be given gifts by Him, to be used of Him! All of these truths make me want to shout GLORY AND HALLELUJAH! PRAISE THE LORD! Thank you Lord for all You have done in me and for what You are doing through me. Thank you, Sharon, for bringing these truths to my mind. Sometimes I need to look at myself through another perspective. When we can look at ourselves through these truths, who wouldn’t want to be all of these and more for our Father and Savior? 🙂 God bless! Hi Sharon, I LOVE I am COMPLETE in Christ! I’m enough, I’m not too much! I am complete. Last week I shared these scriptures in a printable scripture card format.I’m sharing the link in case you or any of your readers might be interested in printing them and carrying them around. How to choose from a list of truths like this one? I believe every single one of them and thank you for reminding me! It’s been a difficult journey this year; but one filled with faithful people reminding me of Who I belong to and the strength and power that comes from that. I think if I had to choose, I would choose “I am complete in Christ”. There is nothing that is lacking. I can lean on Him and trust Him for everything in my life on this earth and for my eternity! What more could anyone need!! I am a child of God! I’m saving this message In my stored mail so I can pull it up and reread as many times as needed. For me gonna need it often! Sharon just like Jeanette I can’t pick just 1 either. I’ve got a whole lotta room in my heart for each and every 1 of these because they’re all me too. I thank you so much for your blog but most importantly thank you so much for the list. Both are truly a blessing just like you. I thank our God for hooking us up the way that He did. Have a blessed rest of the day in the Lord. My favorite ….no better way to remember your worth. Thank you for the reminder, Sharon. I pray for the women of God who have touched my life daily, including you, whether well-known or not. I am blessed to have two godly women in my life for prayer, support, and love through all God has brought me through since my husband died a little over 3 years ago. And bonus, He has brought a new incredible love and his son into my life – never thought I would have a child of my own – Nicholas has been without a mom for 4 years – died of cancer. Thank you for your authenticity and pursuit of God and that you share it with all of us. Praise Him and thank Him. I am redeemed and forgiven through Christ’s blood and can’t no one tell me anything different. I’ve been washed clean in by his blood. Amen thank you Jesus. Eph. 2:10 “I am God’s creation-created in Christ Jesus for good works, which God prepared ahead of time so that I could walk in them”. Thank you for reminding me how much Gods loves me! All, but “I am free from condemnation from Romans 8:1 stands out. Thank you and praise the LORD! I am able to do all things through Christ who gives me strength. Philippians 4:13. A complete verse to get you moving in whatever difficult situation you are in. I am a saint. That is a hard one to say out loud. Hi Sharon, I love all of these verses. However despite being a christian for a number of years I am becoming increasingly aware that I am a new creation. That really means that my past stuff is finished, it’s dead. I really am new. I believe that for me 2014 is about discovering how to live as a new creation. Very exciting. It is especially comforting, exciting and totally awesome to be reminded that I am valuable to God. This means that I have worth and dignity. Wow! Thank you so much for your devotions, God has used them to bless me mightily and to constantly remind me that we have a hope and a future. I love them all! During tough times in life, I have to remind myself that I am a child of God and I can do all things through Him! Hi, Sharon. 🙂 Romans 8:2, “I am free in Christ.” Amen. Amen. Amen. Have a blessed day. I am chosen and appointed by Christ to go and bear fruit. John 15:16. Sharon, Thank you for all of these encouraging scriptures! I love them all….They all are mine to keep…thank you Sharon….I love your book I just got…praying for your husband head to toe….. I love them all. These are nuggets of peace, love joy and all the riches in Christ and I possess and internalize them to bear fruits to our God. I shared this with one of my nieces that’s having a crisis of faith and it really spoke to her (as it did me). I’ve since taken the list and transformed it into an outline. I hope to use this outline to spark many discussions with women in my own sphere of influence. Im a little late in reading this, our what I really believe is God has a divine appointment for each one. I have been a Christian since 23. I just realize today what my life has been missing, I believe God showed me today that after all these years I never really knew who I was in Christ. And what is so awesome is that I asked the Lord to guide me to where I need to start knowing who I am. So that is why I am here tonight. I know that this is why I have been struggling with inner peace for many years. My question is why did it take so long for me to see this. Thank you Sharon for your obedience in Christ. I so enjoy reading your comments and blog. 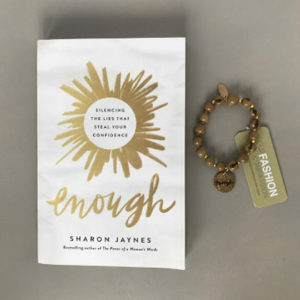 I understand my identity in Christ more deeper now and because of this I feel more joyful and free than I ever did..Thank you Sharon for the book “Enough”.This book has impacted me greatly and I want to encourage every women struggling with identity issues to read this book.